Six weeks ago A. and I were getting facials and thoroughly enjoying our lives. The next week her dad was diagnosed with cancer and 5 weeks later he was gone. His memorial service today was attended by at least 400 people, and the theme of the remembrances was the generosity and hospitality of this man who laughed loudest at his own jokes and lived to see people be happy and comfortable. During the sermon, the priest even briefly wore the Viking helmet that anyone on their maiden voyage on his floating raft was asked to don. It was all about loving life. Our office essentially closed up shop so people could attend the service, except for the few who were willing to stay and worked really hard so others could go. As a group we've sent flowers, organized meals, and donated leave time. We've cried with and for A., and our physicians called in favors and greased wheels to make her dad's medical care go as smoothly as something like that can possibly go. As I looked at my friends huddled up at the back of the church after the service it was hard not to love life. I'm fortunate enough to know really good people - kind, generous people who laugh at their own jokes and only want other people to be happy. 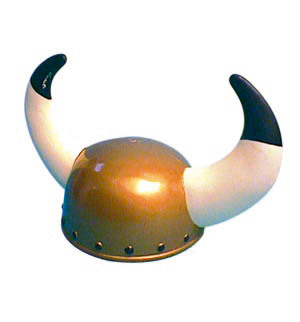 The majority of us had worn the Viking helmet at some point. I'm inspired to be better because of these people, and am thankful for the life of this man who inspired them. It was a very good day.